Two of the West’s preeminent water organizations report Las Vegas Valley is sitting on an oasis of water and money savings. In their new report, the Pacific Institute and Western Resource Advocates find up to 40% of water could be saved in some sectors through improvements to indoor and outdoor water efficiency. They also found that through improving indoor water efficiency in particular, Las Vegas residents and businesses can cut water-related energy use and greenhouse gases. 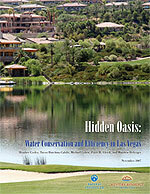 These findings are contained in Hidden Oasis: Water Conservation and Efficiency in Las Vegas available for download below. Hidden Oasis reveals that the Southern Nevada Water Authority, which provides water to Las Vegas and surrounding communities, can tap a number of tested, cost-effective efficiency measures to cut current water waste by up to 86,000 acre-feet. Single-family homes in Las Vegas use 100 gallons of water outside, per person, per day—almost entirely for landscaping. This use is substantially higher than in Los Angeles, Tucson, or Albuquerque. Reducing Las Vegas’ outdoor water use to more reasonable levels could cut Nevada’s total Colorado River withdrawals by 10 percent. Researchers found that by improving and expanding existing programs, and adding programs proven elsewhere in the West, the SNWA can cut Las Vegas homeowners’ indoor water waste by 40% and hotel and casino water waste by 30%. These indoor efficiency gains come from upgrading fixtures and appliances, not changing behavior. Improving total water efficiency not only saves significant water and energy expenses, it also better insulates the region from drought. Hidden Oasis notes an imbalance in the regions budget priorities. For every fourteen dollars it spends on developing new sources of water, it spends only one dollar on helping its customers use water wisely, and less than a dime of that goes to indoor efficiency efforts. As a result, researchers find that more balanced funding, better implementation, and incorporation of proven strategies would greatly improve the Valley’s indoor and outdoor efficiency efforts. “In all, Las Vegas is sitting on a tremendous opportunity to help the Valley’s current and future water users save water, energy, and money,” said Cooley.